Rodrigo Llançol de Borja was born on 1 January 1431 in the town of Xàtiva in the Kingdom of Valencia, one of the component realms of the Crown of Aragon, in present-day Spain. He would become not only one of the most controversial Popes of all time, but also the man who would seed the legend known as the Borgias! His parents were Jofré Llançol i Escrivá and the Aragonese Isabel de Borja. His family name is written Llançol in Valencian and Lanzol in Spanish. Rodrigo adopted his mother's family name of Borja in 1455 following the elevation to the papacy of his maternal uncle Alonso de Borja as Calixtus III, the first Spanish-born Pope (and here you thought that until recent times all Popes were Italian!). Even though for years Rodrigo was a Cardinal and eventually became Pope Alexander VI, he had multiple mistresses, and his children from one of them, Cesar (which was his name and how he signed documents, but known in Italian as Cesare) and Lucrezia, continued his seed and presence in a family destined to become one of western history's most nefarious names. Via Alexander VI was known for his patronage of the arts, and in his days a new architectural era was initiated in Rome with the coming of Bramante. Raphael, Michelangelo and Pinturicchio all worked for him. He commissioned Pinturicchio to lavishly paint a suite of rooms in the Apostolic Palace in the Vatican, which are today known as the Borgia Apartment. In addition to the arts, Alexander VI also encouraged the development of education. In 1495, he issued a papal bull at the request of William Elphinstone, Bishop of Aberdeen, and King James IV of Scotland, founding King's College, Aberdeen. King's College now forms an integral element of the University of Aberdeen. 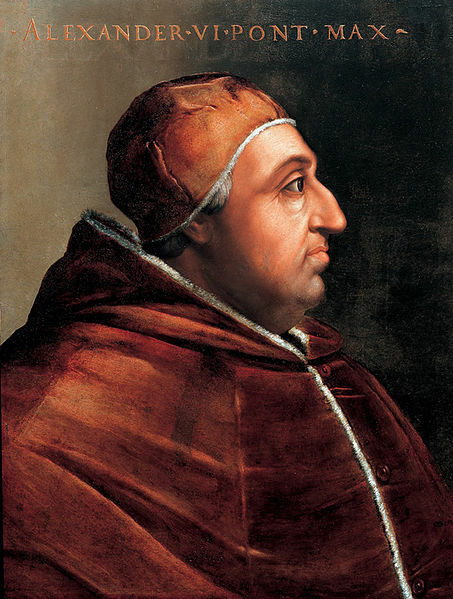 Alexander VI, allegedly a marrano according to papal rival Giuliano della Rovere, distinguished himself by his relatively benign treatment of Jews. After the 1492 expulsion of Jews from Spain, some 9,000 impoverished Iberian Jews arrived at the borders of the Papal States. Alexander welcomed them into Rome, declaring that they were "permitted to lead their life, free from interference from Christians, to continue in their own rites, to gain wealth, and to enjoy many other privileges." He similarly allowed the immigration of Jews expelled from Portugal in 1497 and from Provence in 1498.